Cats have an inner, third eyelid, called a nictating membrane (also spelled "nictitating"), which serves to protect the eye from dryness and/or damage. When a cat is sick, the third eyelid will partially close which is a signal to get him to the vet immediately if other symptoms present. Curiously enough, a very happy cat will also show that nictating membrane. "Like many other physical characteristics of the cat, his moods are reflected by his eyes. Pupil size changes are the clue: an angry cat will have narrowed pupils, while an excited or frightened cat will have eyes wide open, with large pupils. A mellow, happy cat's eyes will sometimes appear a shade darker than normal. I can't explain this one; it's just an observation." From "What Makes Cats Work"
Cats are subject to a number of the same conditions we sometimes have, including cataracts, glaucoma, and conjunctivitis (pinkeye). The latter, if caused by the chlamydia bacteria, may be contagious to humans. 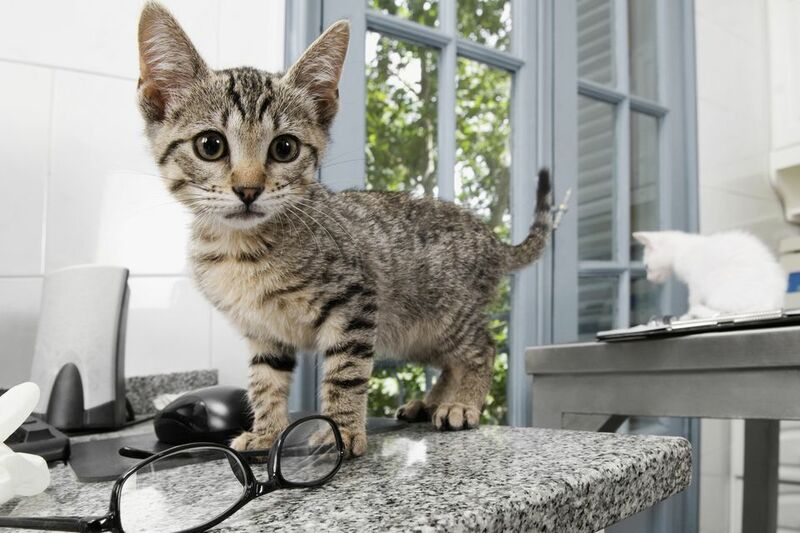 Since cats' eyes are so important to their general welfare, it is crucial that you take your cat to a veterinarian at the first sign of trouble. Many conditions can be treated easily if caught in time but can lead to months of veterinary expense and possibly even blindness, if ignored. Cats' nocturnal vision is far superior to that of humans. While they can't see in total darkness, they can with only one-sixth of the illumination we need to see. In the feline, the muscles of the iris surrounding the pupils are constructed in a way that allows the eye to narrow to a vertical slit in bright light and to open fully in very dim light to allow maximum illumination. In addition, a reflective layer behind the cat's retina, called the tapetum lucidum, reflects incoming light and bounces it back off the cones, making more use of the existing light. The tapetum is probably responsible for the shiny green orbs you see when a small amount of light hits a cat's eyes at night. These special feline features have probably developed for survival purposes, as wild cats are nocturnal and do much of their hunting at night. In 2000, a team of scientists at the University of California in Berkeley used cats to learn more about human vision. During the controversial experiment, the team, led by Yang Dan, assistant professor of molecular and cell biology, anesthetized the cats and then implanted electrodes into their brains and showed them images. They were able to record the cats' responses to light and dark and using a mathematical equation, they converted the signals into images. Since cats' eyes are so similar to humans, the team hoped to answer a number of questions about how the eye and the brain work together to capture, encode and reassemble images. Cats cannot see directly beneath their noses. You can test this by offering your kitty a treat. He can smell it, but if you drop it directly beneath his nose, he'll have to root around a bit before finding it. Rumors aside, cats are not color blind. Their ability to see color is not as enhanced as ours, but they can see some colors. If normal human vision is 20/20, then that of the cat is 20/100. It has keen vision for objects far away, but things up close may appear fuzzy or blurred. Perhaps this is why cats do the sniff test when greeting friends. Most white, blue-eyed cats are deaf. A white cat with odd eyes (one blue and one green or gold) will most often be deaf on the side with the blue eye. Cats "kiss" with their eyes. Of course, a nip on the nose is also their way of giving a kiss. If you want to show your cat you love him, give it a kitty kiss right back. Not on the nose. Just give it that long stare and slow blink and see what happens.